Dandheni Andrew Nhlangwini is best known for his interpretative works that reflect traditional African narratives and oral histories, an area in which George Pemba was a pioneer. These personal interpretations are all the more poignant for their interweaving of personal experience with that of official history. Through a subtle juxtaposition of personal and collective memory, Nhlangwini's works comment on the ever-present tension between individuals, their contexts and the official narratives that, in their attempt to objectively portray human history, forget the place of individuals in that history. In doing so, his works become indicative of the greater human struggle for individuals to reclaim their own voices from the totalising grip of tradition, history and established knowledge. Nhlangwini graduated from the University of Fort Hare Fine Art Department in 1993 and has completed his Masters in Technology for Fine Art at the Port Elizabeth Technikon. 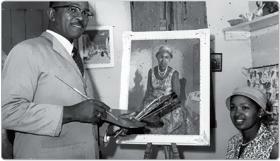 He has worked as an art teacher and now lectures at the Nelson Mandela Metropolitan University School of Creative Arts. He has presented papers to several conferences, including an exploration of the state of mural art in South Africa.